Here is the initial announcement for the trip. This is the second announcement for the trip. Here is the RIDE SHARE PAGE. Here is the FIELD GUIDE (aka GUIDEBOOK). Here is the LOGISTICAL INFORMATION. Thanks for your interest in the upcoming PNW FOP! You’re receiving this email because you responded to our initial interest survey with a “definitely” or “possible” response, and here we will provide the essential information for the field trip. We hope you’ll join the festivities, and please pass this on to others who may be interested but weren’t on the original mailing list. Please send any questions you may have to pnwfop2015@gmail.com, and we’ll respond as soon as possible. First important note: It is very important that we get firm participant numbers as soon as possible, so the following cost and payment info requires your action! A per-person fee of $30 will cover campsite and minor logistical costs. All transportation, food, and Olympic National Park entrance fees in the Elwha valley will be covered directly by the participants. We have set up a PayPal account to collect the camping funds, and we ask that you make the payment and confirm your participation as soon as possible. As a non-organization, FOP has no resources or infrastructure, and we have to recoup all costs! Please pay $30 per person at PayPal.com using this link. As the payments will also confirm participation, they will give us the final participant numbers (and names) for campground reservations and fees. Thursday night, 9/17 and Friday night 9/18: Falls Creek Campground, Lake Quinault south shore. See link below and appended map. If you are planning to drive out to Quinault Lake early Friday morning instead of Thursday, the first meeting location is described below. Saturday night, 9/19, Crescent Beach RV Park, Strait of Juan de Fuca, west of Port Angeles. We have 15 tent campsites reserved per night, and that should be ample space but will require sharing of campsites, depending on the actual turnout. If the response numbers rise further, we will add more campsites as possible. We’ll all fit in any case, in classic FOP style. If you prefer camping in greater solitude, there are good alternate campground options in each of the two areas. If you prefer to stay under a solid roof, there are also good options. For Thursday and Friday night, lodging is available at several Lake Quinault area lodges, at Kalaloch Lodge (20 miles north), in Forks (ca. 50 miles north) and in Hoquiam/Aberdeen, about 60 miles south. For Saturday night, lodging is available in Port Angeles and smaller towns nearby. To keep up-front costs low, we will not print the field guide. Instead, we will post the field guide online a week ahead of the trip for participants to download and print, bring electronically, or memorize ahead of time. We intend to have it posted by noon on Monday, September 14, HERE. There is a ride share sign up page here. Tell people if you have extra room or if you are looking for a ride to share. Well behaved dogs are welcome as always, but there are potential complications. Please note that we will be on National Park Service Land and Quinault Indian Nation-owned or managed land for some of the stops. NPS rules regarding dogs are, of course, rather strict. 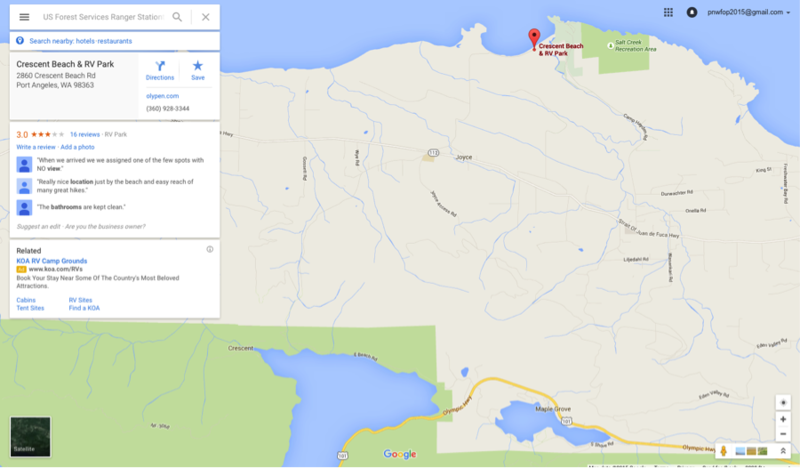 Please check the Olympic National Park rules on dog access to beaches and trails. Also, Quinault Lake, the first stop on Friday, has recently been a sensitive site for water quality and access issues, and there may be dog restrictions for that stop. We do need to stay in the good graces of the park and the Quinault Nation. VERY IMPORTANT! As navigation to some of the stops is complicated, it is important that you join the group at the appointed location at the start of each morning. This will be simple if you are camping with the group, and the information below will help you find the group at the start of each day if you are staying on your own. These meeting locations will also be good places to carpool for the day. Friday, September 18. 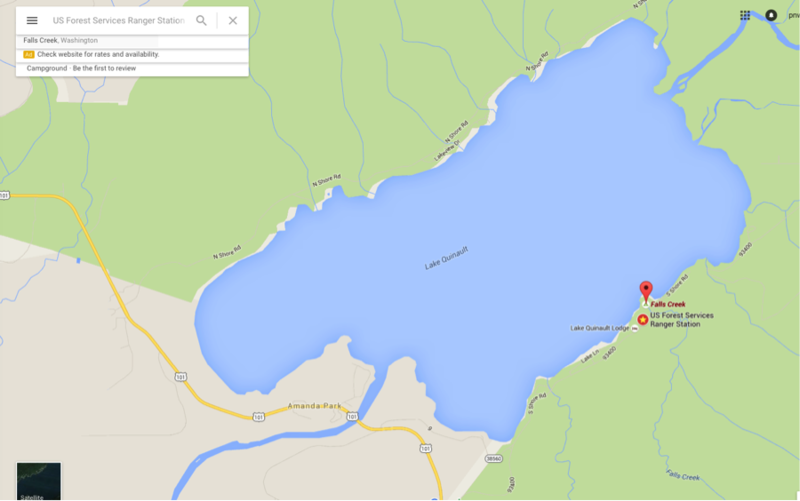 Meet at the Lake Quinault Ranger Station, south shore road, at 9 AM. This is very close to the Falls Creek Campground, and is our first science stop of the day. We will be introducing the trip and talking about Lake Quinault coring project results on the lakefront below the ranger station for about an hour. See the Google Maps link below and the appended map. Saturday, September 19. 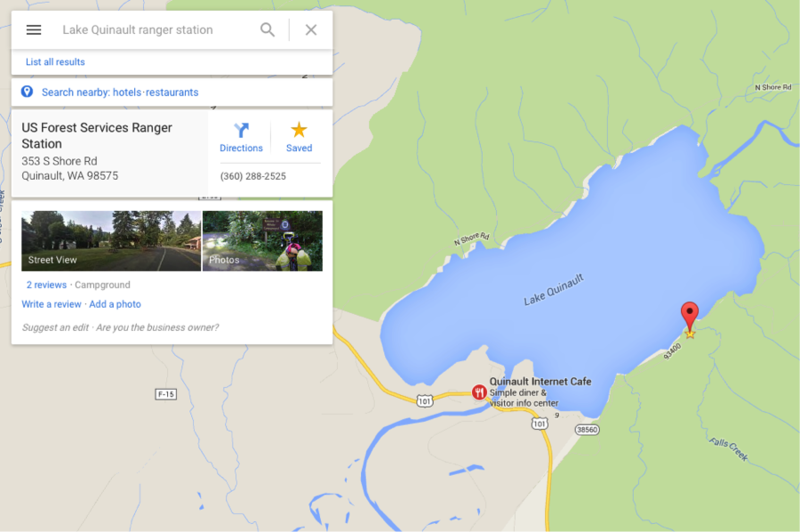 Meet again at the Lake Quinault Ranger Station, south shore road, at 9 AM. See link above and appended map. We will depart right away for points north. Sunday, September 20. Meet at 9 AM at Lairds Corner Park and Ride lot, near the intersection of Hwy 101 and 112, west of Port Angeles. See link below and appended map. 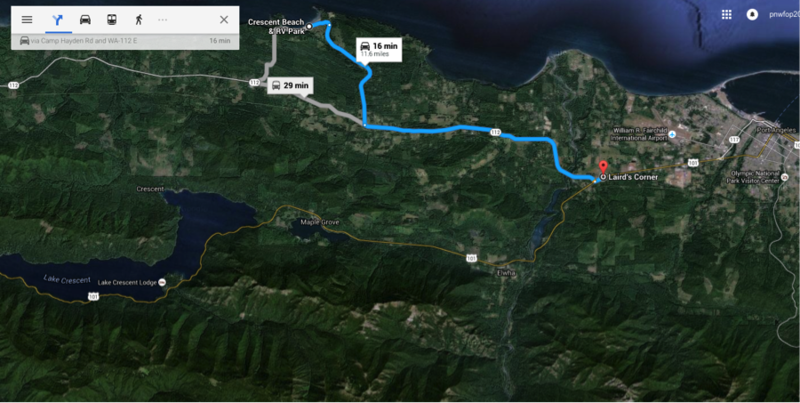 It is important that we carpool from here for the drive into the Park up the Elwha River. Do not know if this is where comments go but just in case. Are there any fees for the Olympic FOP? Has any decision been made about meeting/camping location? Is there a reading list? Thanks. I have sent emails to find out it there are any updates and have not heard back yet. Hopefully they will post some more information very soon! time is ticking away and people need to make their plans! I live on the Long Beach Peninsula Wa. looking for a car pool ride. I am approximately 20 km from Hwy 101. I also suggest you include some contact information. Please post there and I will delete your post here to reduce confusion. I have 2 maybe 3 seats to offer. Leaving from Olympia, WA Thurs. afternoon/eve. I will be returning to Oly Sat. so riders will need to find return rides from north side of Peninsula Sunday. I have been to FOP it was local here in Humboldt County California. I drove Bud Burke around since he was one of my HSU professors. I have taken about every class that HSU offers but structure which the professor (Cashman)won’t let me in because I have not taken calculus. I have been on many field trips to the eastside of the Sierra with Humboldt Geology Department . I have many Geology friends on facebook My youngest daughter lives in Shelton Washington.